Bilateral lacrimal gland prolapse in the quiescent stage of blepharochalasis syndrome. Courtesy of Kathleen Duerksen, MD. Upper and lower eyelid edema in blepharochalasis syndrome. Notice the left pseudoepicanthal fold. Courtesy of Kathleen Duerksen, MD. Various disease stages have been observed. In 1926, Benedict described a swelling stage and a subsequent stage characterized by thinning skin. Others have suggested an active, intumescent phase that precedes a quiescent, atrophic phase. Blepharochalasis is often confused with dermatochalasis, which refers to the lax and redundant skin most commonly observed in the upper eyelids with aging. However, dermatochalasis is usually not associated with recurrent attacks of edema, “cigarette-paper” skin, and subcutaneous telangiectasia, as observed in blepharochalasis. Blepharochalasis is an uncommon disorder with a typical initial presentation in adolescence or young adulthood and no clear gender predilection. The intermittent attacks occur less commonly as the person ages. While the exact cause of this syndrome is unknown, several associations have been noted. A relationship with Ascher syndrome, consisting of upper lip edema and nontoxic thyroid enlargement, has been suggested. One case of blepharochalasis associated with dermatomyositis and lymphocytic leukemia has been reported. Others have proposed that blepharochalasis is exacerbated by hormonal influences (may explain the common onset with puberty), menstrual cycles, upper respiratory tract infections, and allergies. In several individuals, systemic abnormalities (eg, vertebral anomalies, renal agenesis, congenital heart disease) have been found. A hereditary form of the disease may exist; Panneton observed varying degrees of the syndrome in many members of a large family. Autosomal dominance with incomplete penetrance and variable expressivity is possible. The finding of immunoglobulin A (IgA) deposits in lesional skin has implicated immunopathogenic causes. Elevated immunoglobulin E (IgE) levels in one case report supports the involvement of atopy in blepharochalasis. Perivascular infiltrates in patients with active disease, along with degradation of both elastin and collagen in the dermis, suggest inflammatory influences. Elastin messenger RNA (mRNA) expression has been shown to be normal compared to controls, indicating an environmental cause of breakdown, such as postinflammatory enzymatic action. Matrix metalloproteinase 3 (MMP-3) and MMP-9 may play a role in the development of this disease. Patients report repeated episodes of painless swelling of one or both eyelids with subsequent thinning of eyelid skin, typically starting at approximately age 10–20 years. Edema is almost always observed initially in the upper eyelids. Most cases occur bilaterally, but unilateral instances have been reported. The frequency of attacks is widely variable. A preceding period of physical or emotional stress may be reported. A history of allergy is occasionally elicited. 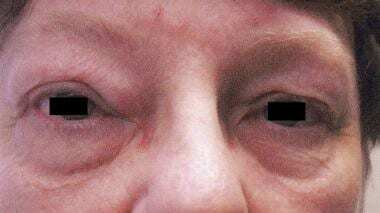 In the early active phase, patients present with nonerythematous edema of one or both upper eyelids. Patients rarely (and only in severe cases) present with nonerythematous edema of the lower eyelids. Thinning of the eyelid skin may be present in the active stage of the disease. Other physical findings include proptosis, blepharoptosis, blepharophimosis, conjunctival injection, and eyelid malposition. Surgery is primarily indicated for correction of sequelae in those who have achieved a stable course later in the disease. Corrective procedures may include levator aponeurosis dehiscence repair, canthal tendon reattachment, eyelid tightening, blepharoplasty, and fat grafting. The eyelid skin is extremely thin and distensible, which may promote vulnerability to further thinning and wrinkling after an episode of severe edema. The levator aponeurosis, the tendonous continuation of the levator palpebrae superioris muscle, attaches to the anterior surface of the tarsus in the upper eyelid. This structure may similarly undergo thinning and stretching during edematous attacks, leading to aponeurotic upper blepharoptosis. Likewise, stretching of the orbital septum allows prolapse of the tissues behind (including orbital fat and lacrimal gland). Those experiencing active episodes of edema should not undergo surgery. Surgical candidates should have displayed at least 6 months of quiescence.Systemic steroids, topical steroids, antihistamines, and anti-inflammatory agents have not been shown to alter the course of the disease or to alleviate the symptoms associated with acute episodes. Fuchs E. Ueber Blepharochalasis (Erchlaffung der Lidhaut). Wien Klin Wochenschr. 1896. 9:109-10. Koursh DM, Modjtahedi SP, Selva D, Leibovitch I. The blepharochalasis syndrome. Surv Ophthalmol. 2009 Mar-Apr. 54(2):235-44. [Medline]. Mercy P, Ghorpade A, Das M, Soud A, Agrawal S, Kumar A. Blepharochalasis. Indian J Dermatol Venereol Leprol. 2009 Mar-Apr. 75(2):197-9. [Medline]. Brar BK, Puri N. Blepharochalasis--a rare entity. Dermatol Online J. 2008 Jan 15. 14(1):8. [Medline]. Benedict WL. Blepharochalasis. JAMA. 1926. 87:1735-9. Karoconji T et al. Doxycycline for treatment of blepharochalasis via inhibition of matrix metalloproteinases. Ophthal Plast Reconstr Surg. May-Jun. 28:76-8. [Medline]. Panneton P. Memoire sur le blepharochalasis: a propos de 51 cas dans une meme famille. Union Med Can. 1936. 65:725-49. Wang G, Li C, Gao T. Blepharochalasis: a rare condition misdiagnosed as recurrent angioedema. Arch Dermatol. 2009 Apr. 145(4):498-9. [Medline]. Drummond SR, Kemp EG. Successful medical treatment of blepharochalasis: a case series. Orbit. 10:313-6. [Medline]. Kaneoya K, Momota Y, Hatamochi A, Matsumoto F, Arima Y, Miyachi Y, et al. Elastin gene expression in blepharochalasis. J Dermatol. 2005 Jan. 32(1):26-9. [Medline]. Barnett ML, Bosshardt LL, Morgan AF. Double lip and double lip with blepharochalasis (Ascher's syndrome). Oral Surg Oral Med Oral Pathol. 1972 Nov. 34(5):727-33. [Medline]. Bartley GB, Gibson LE. Blepharochalasis associated with dermatomyositis and acute lymphocytic leukemia. Am J Ophthalmol. 1992 Jun 15. 113(6):727-8. [Medline]. Beard C. Ptosis. St. Louis: Mosby; 1981. Bergin DJ, McCord CD, Berger T, Friedberg H, Waterhouse W. Blepharochalasis. Br J Ophthalmol. 1988 Nov. 72(11):863-7. [Medline]. Botella-Estrada R, Martinez-Aparicio A, de la Cuadra J, Aliaga A. [Unilateral blepharochalasis]. Ann Dermatol Venereol. 1992. 119(2):119-21. [Medline]. Collin JR. Blepharochalasis. A review of 30 cases. Ophthal Plast Reconstr Surg. 1991. 7(3):153-7. [Medline]. Collin JR, Beard C, Stern WH, Schoengarth D. Blepharochalasis. Br J Ophthalmol. 1979 Aug. 63(8):542-6. [Medline]. Custer PL, Tenzel RR, Kowalczyk AP. Blepharochalasis syndrome. Am J Ophthalmol. 1985 Apr 15. 99(4):424-8. [Medline]. Dózsa A, Károlyi ZS, Degrell P. Bilateral blepharochalasis. J Eur Acad Dermatol Venereol. 2005 Nov. 19(6):725-8. [Medline]. Esmaeli B, Prieto VG, Butler CE, Kim SK, Ahmadi MA, Kantarjian HM, et al. Severe periorbital edema secondary to STI571 (Gleevec). Cancer. 2002 Aug 15. 95(4):881-7. [Medline]. Finney JL, Peterson HD. Blepharochalasis after a bee sting. Plast Reconstr Surg. 1984 May. 73(5):830-2. [Medline]. Garcia-Ortega P, Mascaro F, Corominas M, Carreras M. Blepharochalasis misdiagnosed as allergic recurrent angioedema. Allergy. 2003 Nov. 58(11):1197-8. [Medline]. Ghose S, Kalra BR, Dayal Y. Blepharochalasis with multiple system involvement. Br J Ophthalmol. 1984 Aug. 68(8):529-32. [Medline]. Grassegger A, Romani N, Fritsch P, Smolle J, Hintner H. Immunoglobulin A (IgA) deposits in lesional skin of a patient with blepharochalasis. Br J Dermatol. 1996 Nov. 135(5):791-5. [Medline]. Hundal KS, Mearza AA, Joshi N. Lacrimal gland prolapse in blepharochalasis. Eye. 2004 Apr. 18(4):429-30. [Medline]. Jordan DR. Blepharochalasis syndrome: a proposed pathophysiologic mechanism. Can J Ophthalmol. 1992 Feb. 27(1):10-5. [Medline]. Langley KE, Patrinely JR, Anderson RL, Thiese SM. Unilateral blepharochalasis. Ophthalmic Surg. 1987 Aug. 18(8):594-8. [Medline]. Randolph RL. A Case of Blepharochalasis-A Variety of Dermatolysis. Trans Am Ophthalmol Soc. 1916. 14:518-9. [Medline]. Shorr N, Christenbury JD, Goldberg RA. Free autogenous "pearl fat" grafts to the eyelids. Ophthal Plast Reconstr Surg. 1988. 4(1):37-40. [Medline]. Smith B, Petrelli R. Surgical repair of prolapsed lacrimal glands. Arch Ophthalmol. 1978 Jan. 96(1):113-4. [Medline]. Stieren E. Blepharochalasis-Report of Two Cases. Trans Am Ophthalmol Soc. 1914. 13:713-9. [Medline]. Tenzel RR, Stewart WB. Blepharo-confusion--blepharochalasis or dermatochalasis?. Arch Ophthalmol. 1978 May. 96(5):911-2. [Medline]. Motegi S1, Uchiyama A, Yamada K, Ogino S, Takeuchi Y, Ishikawa O. Blepharochalasis: possibly associated with matrix metalloproteinases. J Dermatol. 6. 41:536-8.